This is great! The BBB have posted another challenge where I just happened to have the special ingredient necessary, languishing in the pantry, needing to be put to use. ☺ I don't remember why I bought the graham flour in the first place, but I haven't used it in some time. Now I will be using it in a great sourdough starter. 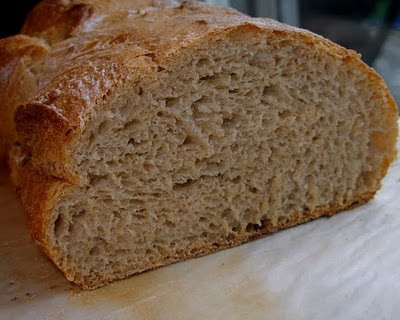 This turned out to be a fabulous bread: it's mildly sweet, mildly sour, deliciously chewy, and great for many things. Soup sopping, toasting, grilling, eating out of hand... My daughter begged me to cut into it straight out of the oven. I could barely get her to wait for it to cool. "I'll blow on it, pleeeease? It's not too hot..." She's right though, there are few things better than fresh bread out of the oven, slathered in butter and maybe some homemade jam. 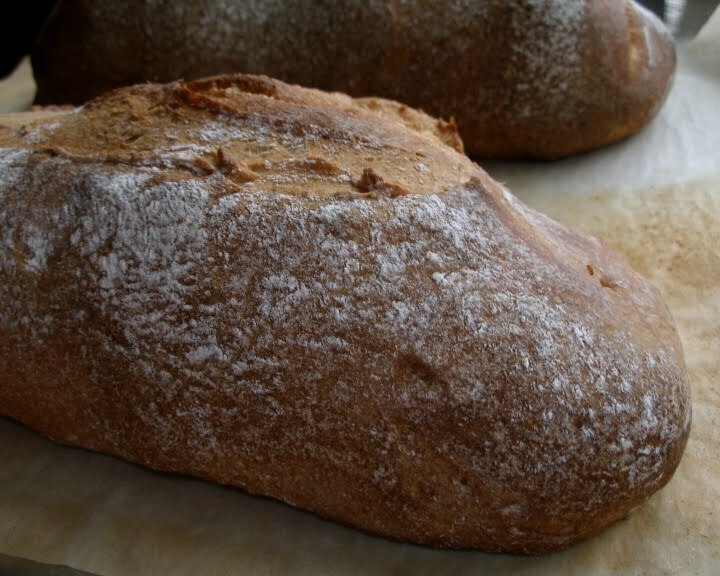 This bread hails from a little bakery in Stockholm where it is baked in loaves more than two feet long. Check out Grain Doe and the original post for more information. 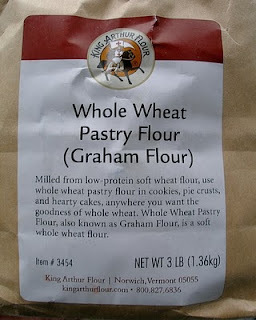 Now since there seem to be different definitions and even appearances of graham flour floating around in stores, I'll just add mine as well. 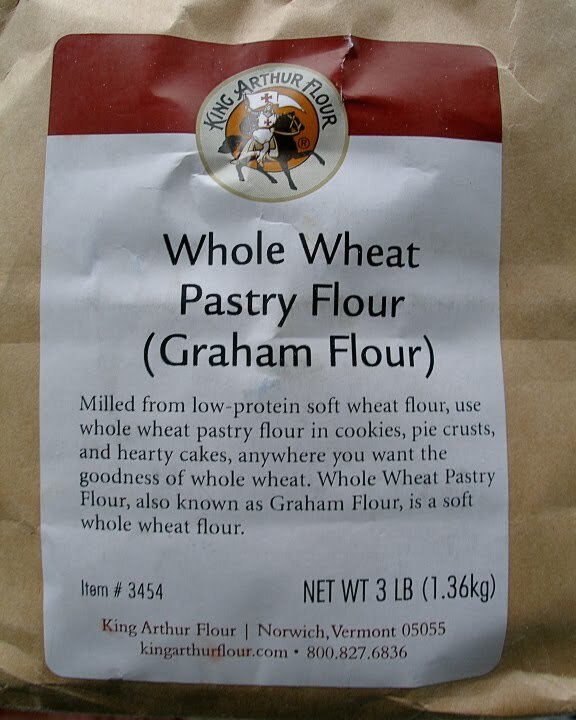 Here is what my graham flour looks like and the King Arthur description of their own "graham flour". You can see the little bits of bran and germ left in the flour. Now I don't know if all graham flour is milled from soft wheat but I assume that's why the need for a high protein flour in the rest of the loaf. 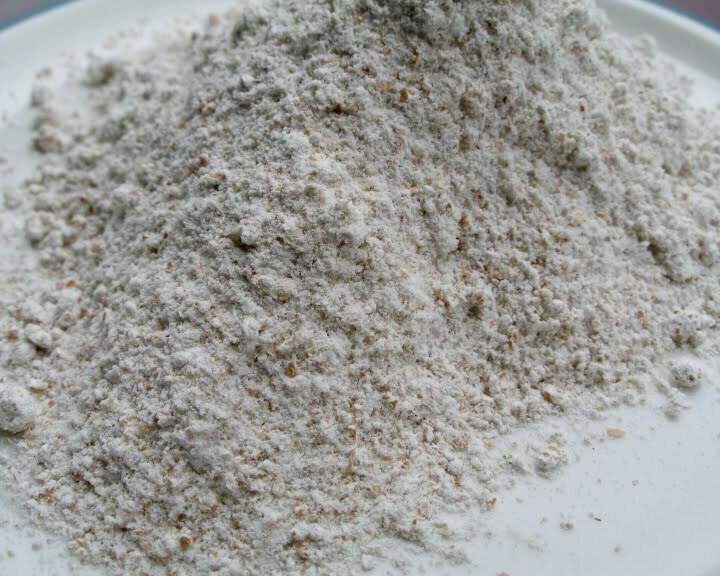 King Arthur's AP flour is 11.7% protein, their bread flour 12.7% and their special high gluten flour is 14-14.2% protein. Since high protein definitions range from 12-14%, I'd guess bread flour would work just fine. For general baking I only keep AP and white whole wheat on hand. So I tossed in a couple teaspoons of gluten. I think it probably would have turned out fine without it. Feed the sourdough with 60g/100 ml/0,42 cups graham flour and 60 g/60 ml/0,25 cups water. Mix all ingredients except the salt. Work the dough in a stand mixer for 10 minutes or by hand for 20. Add the salt. Knead the dough for 5 minutes more. Put the dough in a oiled, plastic box and put the lid on. Leave the dough for 30 minutes. Pour out the dough on a floured table top and divide it lengthwise with a sharp knife. Put the dough halves on a sheet covered with parchment paper and place another parchment paper or a towel on top. I dusted them with some flour at this point. When the oven is ready, put in the sheet or shove the parchment paper with the loaves onto the baking stone. Put a small tin with 3-4 ice cubes at the bottom of the oven. (The water releases slowly which is supposed to be better.) Lower the oven temp. to 175 C/350 F immediately after you have put in the loaves. Now, you'll get a better crumb when you cut if you can at least wait until your loaf is cool. Or at least not still steaming hot. R couldn't wait that long. I did a half batch and still got two good sized loaves out of it. It was easier dealing with the dough in the fridge with the smaller batch. This﻿ will be submitted to Yeastspotting. Excellent! Your bread looks beautiful. And isn't it interesting how this bread seems to want to burst its seams? I know what you mean about how tantalizing it is to cut into freshly baked bread. But the last time I did it, I was a little disappointed. The bread really hasn't finished cooking. I wonder if a way to let you daughter have her cake (bread??) and eat it too would be to cut away a small part of dough to make a little bun that would be designated as the "eat right away slathered with butter" while the actual loaf cools. Wow, your loaves looks absolutely perfect! And your graham flour looks exactly like mine. Would you like buddy badge? Write your email address here or email me on granivor (at) gmail (dot) com and I will send you one! Lovely loaf! 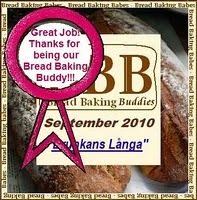 Thanks so much for baking with us this month! your bread look beautiful. Well done ! We loved this bread! Excellent loaf!